Unicaja Malaga opened the 2012-13 Turkish Airlines Euroleague Top 16 by rallying to beat Brose Baskets Bamberg 85-82 in Group E on Thursday. Unicaja earned its fifth consecutive home win, while Bamberg registered its third straight road loss. 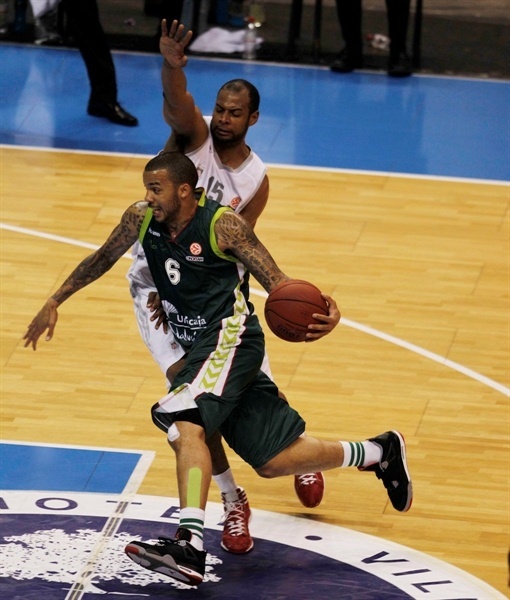 Marcus Williams paced the winners with 18 points. 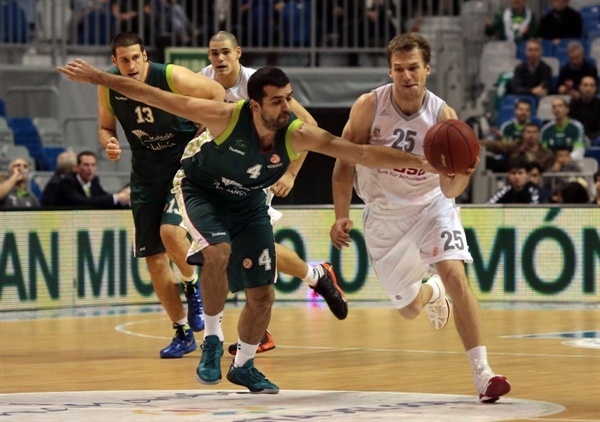 Andy Panko added 16 and 7 rebounds in his first Euroleague game with Unicaja. Sharrod Ford led Bamberg with 16 points on 4-of-6 three-point shooting. 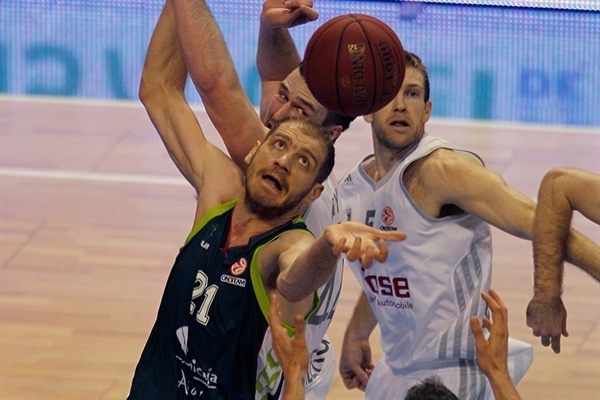 Anton Gavel added 15 points and 8 assists, while Bostjan Nachbar scored 10 points for the guests. Four different players struck from downtown in a 0-15 Bamberg run which allowed the guests to take a 15-19 edge after 10 minutes. Unicaja managed to tie the game at 29-29 midway through the second quarter, but John Goldsberry and Zirbes helped Bamberg to restore a 39-45 margin at halftime. Ford and A.J. Ogilvy helped Bamberg stay ahead, 50-61, midway through the third quarter. 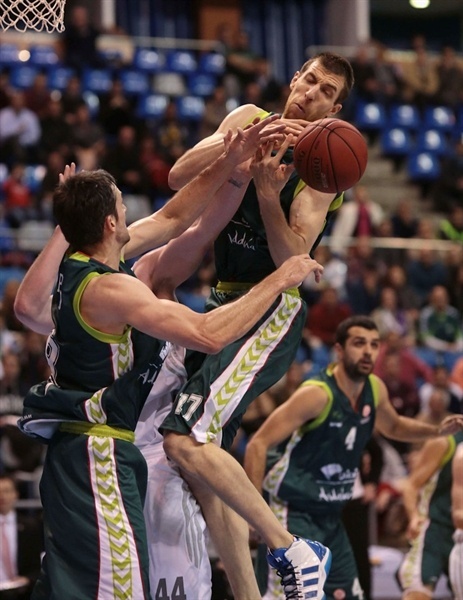 Unicaja improved its defense in the fourth quarter and a tip-in by Williams gave the hosts its first lead, 76-74. A three-pointer by Ford tied the game, 80-80, but an alley-oop slam by Fran Vazquez and free throws by Panko and Williams sealed the outcome down the stretch. Goldsberry got Bamberg going with a three-pointer, as the guests tried to use long possessions and to circulate the ball in the opening minutes. Casey Jacobsen also struck from downtown and Gavel joined the three-point shootout for a 0-9 Bamberg lead. Unicaja was held scoreless for more than three minutes when Ford followed an easy dunk with a triple as Unicaja fans started to wonder at 0-14. Unicaja tried to add firepower by bringing Marcus Williams, Luka Zoric and Panko off the bench. A free throw by Jacobsen capped a 0-15 Bamberg run and even after Zoric stepped up with a layup-plus-foul, Maik Zirbes dunked for a 3-17 lead. 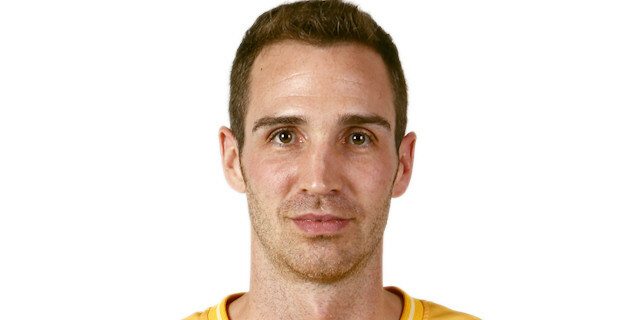 Panko scored in transition and free throws by Zoran Dragic and Sergi Vidal gave Unicaja some hope at 8-17. A.J. Ogilvy sank foul shots that Zoric bettered with consecutive baskets. Dragic split free throws and a buzzer-beating jumper by Williams made it 15-19 after 10 minutes. Nachbar made free throws early in the second quarter and a layup by Karsten Tadda gave Bamberg some fresh air at 15-23. Vazquez scored around the basket, but Jacobsen nailed a stop-and-pop triple for a 17-26 margin. Panko kept pacing Unicaja with a layup and a jump hook by Vazquez kept the hosts within 21-26. Bamberg struggled without Gavel and Goldsberry on the floor and Coach Chris Fleming called timeout to readjust his team’s offense, bringing both players back on court. Dragic hit free throws that Ford improved on with his second three-pointer. Vazquez nailed a five-meter jumper and a triple by Earl Calloway tied it at 29-29. Goldsberry made free throws and a layup by Zirbes restored a 29-33 Bamberg edge. Dragic shined with a fast break layup and Txemi Urtasun erased Gavel's free throws with a running jumper for a 33-35 Unicaja deficit. Zirbes scored again and a three-pointer by Gavel boosted the guest's edge to 33-40. Urtasun and Kosta Perovic made free throws and Vidal nailed a three-pointer, but Ford and Goldsberry allowed Bamberg to reach halftime with a 39-45 lead. Zirbes buried a mid-range jumper right after the break, but Calloway ignited the crowd with a driving layup. Ford stepped up with another three-pointer and free throws by Gavel allowed Bamberg to restore a double-digit lead, 41-52. Panko tried to change things with a layup and followed that with a tip-in. Jacobsen answered with a floating jumper before Perovic and Ogilvy split free throws and a layup by Vidal brought Unicaja a bit closer, 48-57. Ogilvy scored in the paint, but Williams did not miss from the foul line. Gavel nailed a corner jumper to keep Bamberg way ahead, 50-61. Vidal answered from downtown and Williams added free throws, but Nachbar stepped up with a floating layup. Zoric hit foul shots and Unicaja improved its defense, playing more physical late in the third quarter. Williams buried a three-pointer and after Ogilvy split free throws, he struck again from downtown. Free throws by Nachbar gave Bamberg a 63-69 lead after 30 minutes. Fourth quarter: What a finish! 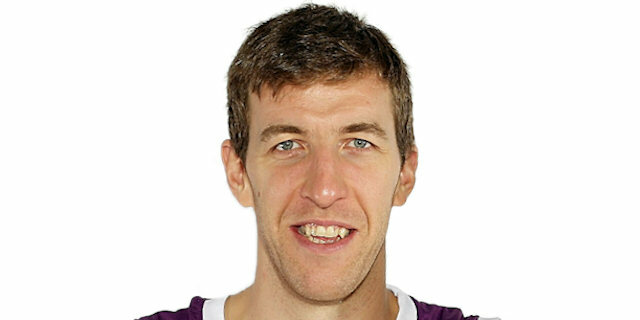 Dragic made free throws early in the fourth quarter and a three-point play by Augusto Cesar Lima made it a one-point game with over eight minutes to go. Nachbar did not miss from the foul line, but Williams shined again with a mid-range jumper. Daniel Schmidt took over with a three-pointer from the top of the key, but Williams scored in penetration to keep Unicaja as close as 72-74. 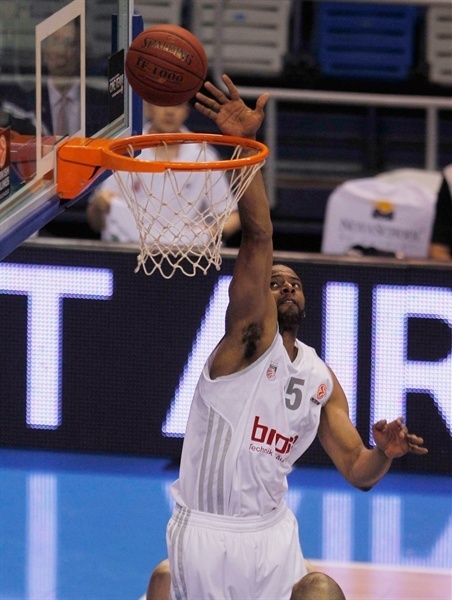 Panko stepped up with a second-chance layup, as Bamberg kept struggling to score right when it mattered most. A tip-in by Williams gave Unicaja its first lead of the game, 76-74, with less than four minutes to go. Gavel hit 3 free throws only for Urtasun to erase them with a critical three-pointer. Calloway soon gave Unicaja an 80-77 edge with 2:20 left. Ford struck from downtown, but an alley-oop slam by Vazquez put the hosts back ahead, 82-80. Bamberg fouled Panko with 28.1 seconds left and he hit both attempts. A huge defensive stop by Vazquez allowed Unicaja to seal the outcome as its fans celebrated a great start in Group E.
"It was a tough game, just as we expected it, against a great team that had never lost in Malaga. This is the Euroleague and we must be focused to beat the best teams in Europe. We shot a lot in the beginning and were surprised by Ford's effectiveness, even though we knew Bamberg has great shooters. We improved in the second half, especially on offensive rebounds, which was important to win the game. Every game will be tough in the Top 16 and we have to be very focused. We must play as a team, with chemistry. We don't have stars, so it is important to play with energy, the way Dragic, Vidal and Panko did today." 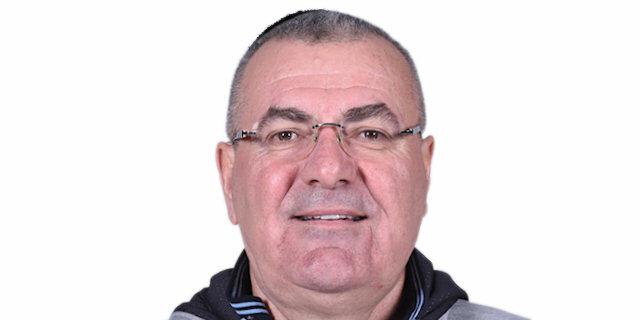 "Congratulations to Unicaja Malaga and its coach Jasmin Repesa for a great comeback. They really wanted to win this game. It is simple to explain - it all came down to one possession. They outrebounded us in the fourth quarter. I feel bad because this could have been a good start. We were not consistent from the perimeter. It is true that we played good basketball, but it was not enough to win this game. I hope we will beat Unicaja in our place." "It is very important to start the Top 16 with a win, especially this season, which will be more complicated with so many games. We cannot allow anyone to beat us at home. 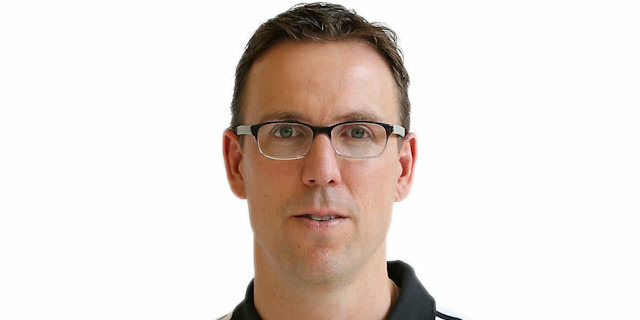 Brose Baskets is a very well-coached team, intense, which works hard and knows what it has to do. I know we will not have it easy when we play in Bamberg. If we start games with a 0-15 deficit, we will lose 95% of those. We will try to have a better start next week." "It was important to win and break last season's curse. Brose Baskets is not an easy team to play against. We did what we had to do - play hard and fight until the end."